Both countries would benefit if Russian companies were given a red carpet to operate in India, especially in infrastructure projects. It was quite obvious that U.S. Secretary of State John Kerry, who was in India this week, was trying hard to ‘persuade’ External Affairs Minister Sushma Swaraj and the Indian government to take a hard line against Russia in the wake of the Ukraine crisis. It’s for good measure that there is now a government in New Delhi that is actually bothered about Indian national interest and not following an agenda that is being set by Washington. India is one of the biggest barriers in America’s plan to completely isolate Russia. Despite a series of completely baseless accusations levelled over the recent shooting down of the Malaysia Airlines aircraft over Ukrainian airspace, most Asian countries have refused to jump on Washington’s sanction bandwagon. China is a country that America has realised can never be swayed in its direction. Its size and growing influence give the world’s second largest economy enough confidence to not be bullied by the West, basically making it a lost cause for Washington. India on the other hand is a key for American designs to divide the world into what it classifies as good guys and bad guys. Although Barack Obama initially seemed less confrontational and much more of a dove than his predecessor, he does his Nobel Peace Prize a disservice. American attempts to turn Russia into a pariah would get a major boost if a powerful Asian country like India decided to join the league of vassal states that point fingers at Russia for everything that goes wrong in Ukraine. Indian Prime Minister Narendra Modi is a pragmatic man and his practical approach to foreign policy will go a long way in building India’s profile. 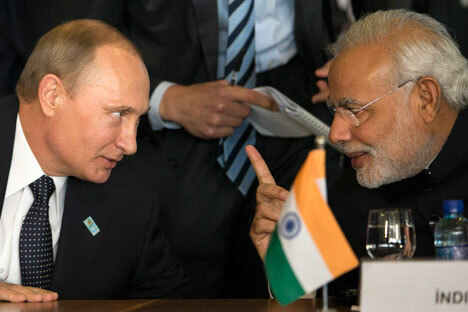 In the history of independent India, Russia (or the USSR) has never acted against Indian interests, despite what the popular global opinion of the time was. Everyone knows about the 1971 veto that Moscow used in the United Nations Security Council when the Americans and British ignored the genocide of Bangladeshis and were trying to get India declared an aggressor in the war against Pakistan. More members of the UN’s General Assembly were sympathetic to Pakistan than they were to India, as were the so-called non-aligned countries. This did not stop Russia’s unwavering support of India. More recently, when India conducted nuclear tests in the Rajasthan desert, Russia, which was weak and heavily under Western influence, refused to support sanctions against India. It was India’s turn in 1998 to be at the receiving end of American sanctions, something the country resisted so well that the US had to change course. It’s now time for India to declare greater support for Russia and call for a complete and impartial probe into both what’s going on in Eastern Ukraine as well as the tragic shooting of MH 17. I suspect that the Ukrainian authorities and their backers in America may not be very keen to have an independent investigation, especially towards the shooting. We all know that the Ukrainian military shot down a Tel Aviv-Novosibirsk passenger aircraft and lied about it for years! When Narendra Modi met Vladimir Putin last month in Brazil, they spoke about widely expanding trade. The very fact that the West is trying to isolate Russia is a good opportunity for Russian companies to expand their cooperation with both India and Indian companies, especially in infrastructure projects. This is the best time to welcome Russian investment in India and offer tax breaks and preferential agreements for Russian businesses. It would be a winning formula for both countries. There is also some talk about trading in national currencies, but here India and Russia need to exercise a lot of caution. There were a lot of complaints from both sides about the way the old rupee-rouble trade was conducted and things threatened to boil over in the early 1990s over the exact evaluation. It may be better to wait and watch how Russia and China are able to trade in roubles and yuan, before replicating the example in trade with India. Many major economies would like to reduce their dependence on the dollar but this has to be done in a practical and planned manner. China’s overt support for Russia has not led to any serious repercussions from the West, simply because America and its allies are afraid of doing anything that would cause mutual and irreparable damage. The same would apply for India, which is now too big and strategically important to risk ‘losing.’ This is precisely why greater cooperation amongst the BRICS nations is making those trying to protect the existing world order nervous. Greater Indo-Russian engagement and cooperation, both bilaterally and in multilateral setups like the BRICS, is one of the keys to a new global order: one that is not dominated by a war-hungry superpower.